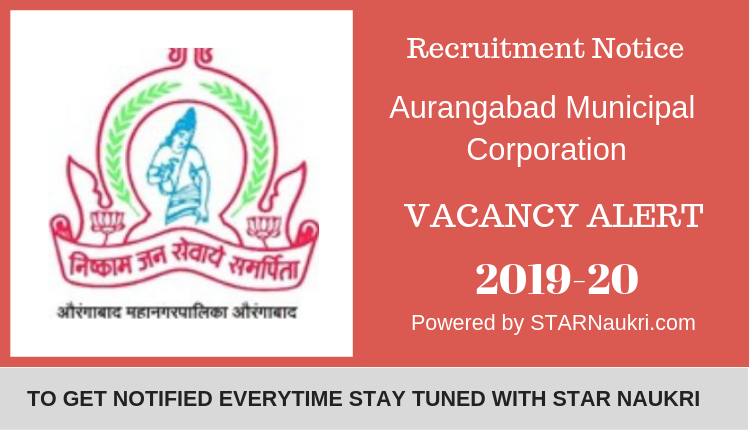 Aurangabad Municipal Corporation published recruitment notice on their official website. There are 11 vacancies for the posts of Junior Engineer (Civil). The date of examination for the post is 24 February 2019 (11:00 AM). औरंगाबाद महानगरपालिका ने त्याच्या अधिकृत वेबसाइटवर (www.m88888) भर्ती नोटिस प्रकाशित केले. महानगरपालिकेमध्ये लोकशाही पद्धतीने निर्वाचित सदस्य असतात, त्याचे अध्यक्ष महापौर होते आणि शहरांचे पायाभूत सुविधा, सार्वजनिक सेवा आणि पोलिसांचे व्यवस्थापन करतात. कनिष्ठ अभियंता (सिविल) च्या पदांसाठी 11 जागा आहेत. 24 फेब्रुवारी 2019 (11:00 एएम) पोस्टची परीक्षा घेण्याची तारीख आहे. ज्यांना या पोस्टमध्ये स्वारस्य आहे आणि पात्रता निकषांनुसार त्यांनी त्यांचे फॉर्म सादर करावेत. तपशील पात्रता आणि अर्जाची प्रक्रिया खाली दिली आहे आणि खाली नमूद केली आहे. Aurangabad Municipal Corporation published recruitment notice on its official website(aurangabadmahapalika.org). The municipal corporation consists of democratically elected members, is headed by a mayor and administers the city’s infrastructure, public services and police. There are 11 vacancies for the posts of Junior Engineer (Civil). The date of examination for the post is 24 February 2019 (11:00 AM). Those who are interested in these posts and according to the eligibility criteria they should submit their forms. The details eligibility and application process are given & mentioned below.